New legislation cracking down on distracted driving in Ontario is being reintroduced this fall. Transportation Minister Steven Del Duca announced yesterday that the distracted driving bill will see penalties for drivers caught texting or talking on handheld devices increased to fines of up to $1,000 and three demerit points-the toughest penalties in the country. This is up from the current fine of $280, which itself was recently increased from $155. If the legislation passes, minimum fines will begin at $300 going forward. The distracted driving legislation will be reintroduced when the legislature resumes on October 20. The aggressive penalties were originally proposed back in March, but tabled shortly after when the provincial election was called. They remained on the forefront of discussions, however, due to the disconcerting amount of deaths related to distracted driving in Ontario. The Ontario Provincial Police reported that distracted driving killed more people than speeding and impaired driving last year. Eighty-six people died. So far this year, 35 people have been killed as a result of distracted driving. 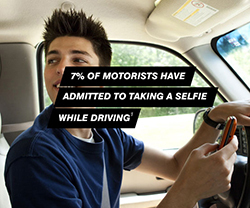 An officer from traffic services recently told us that these numbers are probably much higher, as distracted driving is grossly under reported. "We have to make sure that we push hard, that we introduce penalties that will serve as a deterrent, but that we also raise public awareness to make sure people do understand very clearly what the consequences could be for making the wrong decision," Minister Del Duca said at a press conference. The province is now gearing up for a major blitz that will begin this Labour Day long weekend and continue through fall. Ten unmarked vehicles will be deployed in addition to the regular patrol vehicles used to catch distracted drivers, CP24 reports. All provinces and territories (except for Nunavut) have some form of legislation in place prohibiting drivers from using hand-held devices while behind the wheel. Newfoundland and Labrador was the first region to introduce legislation back in April 2003, with most other provinces following suit around 2010. Until Ontario's penalties were increased, Newfoundland and Labrador held the title for toughest penalties with fines of up to $400 and 4 demerit points. Although there is no legislation that specifically mentions "distracted driving" at this time, if distraction is found to play a role in a collision drivers may also be charged with careless driving, which carries fines ranging from $400 to $2,000, risks possible licence suspension of up to two years, and could land the driver in jail for up to six months. A careless driving conviction will also severely increase the driver's insurance premiums. Penalty increases like this are a reminder of the dangers of distracted driving and will hopefully deter drivers from participating in these risky behaviours. To learn more about distracted driving, visit our #DistractedtoDeath campaign page and take the pledge to not drive distracted. In exchange for your vow to be a safer driver, we'll donate $1 to helping educate teens on distracted driving.